Most executives have heard of “critical path”, but there is another kind of “path” few have heard of that is far more important for project success. Most managers, even those with a rudimentary knowledge of project management theory, know about “critical path”. The critical path of the project determines how long the project will take to finish. Project activities are linked in a network of parallel or sequential activities with start and finish dates to calculate the project completion date. The activities that determine the completion date are said to be “on the critical path”. Tracking how the critical path moves around as dates and resources are altered; adding resources to decrease the time taken; and managing the consequences of any slippage are all part of the standard tool-kit for project managers. Actively managing the critical path is also seen as a key discipline for the Project Governance team given the orthodox emphasis on measuring project success by on-time and on-budget. However, an unfortunate consequence of measuring project success by on-time and on-budget is that we are effectively measuring project success by the Inputsused for the project and thus prioritising those measures, rather by whether the project produces an Output that is of value. This is a little like measuring the success of the new family home you have built by whether you used all the bricks and timber budgeted, i.e., it’s pretty dumb. It is not that cost and time are not important; they are, but only relative to the value achieved. For your family home, your desired outcomes – defining how you to want to live and raise your family, enjoy having friends to visit, care for elderly parents and so on – are what you are trying to achieve. The cost and time to complete the home are irrelevant if the desired family lifestyle is not achieved. 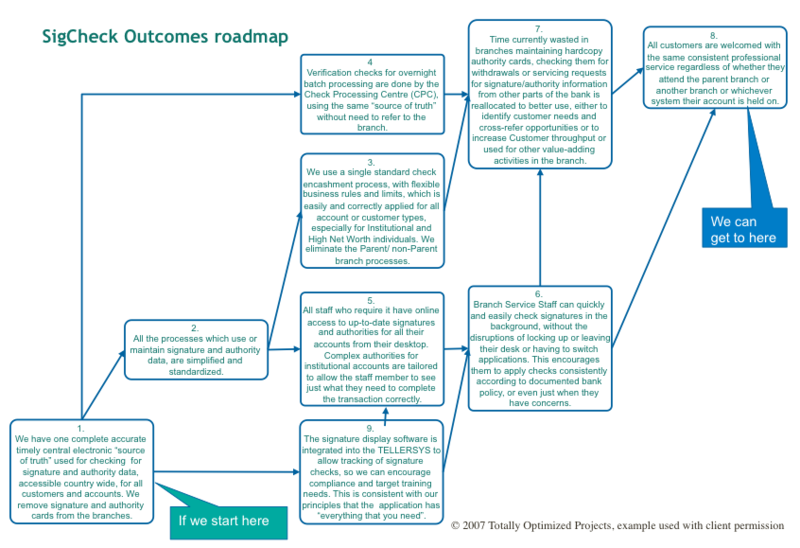 When you shift to measuring project success by what the project produces as outputs – the desired outcomes, benefits and investment value delivered, then understanding what influences the value delivered becomes crucial. That is where the concept of Path Dependency comes in. Path Dependency is not part of the common lexicon of the project management but it should be! The tourist asked a local for directions to Dublin. Translated into English, what that means is: every decision that you make on a project determines what it will achieve, both now and in the future! Path Dependency is a concept most people understand intuitively; each decision either opens up options or closes them down; where you are today on any project is the cumulative result of a series of decisions. Each path dependent decision locks your project into a future path where you either can or cannot (ever) get to where you intend to go. If you wish to ‘undo’ some of the impacts of previous decisions – based on the path dependency – you will need to retrace to the point where the decision was made, undo the decision and make a new one. This might mean going back to the beginning of a project (especially if you’ve bought the wrong software). You can think of path dependency as a set of railway tracks. If you are at a terminus station, you can have a wide variety of destination options. However, as you move forward and select certain tracks – make decisions and choices – you will reduce the number of destination options until you only have one. If you then find that you are ‘on the wrong track’, you need to go back to that point in the journey where you can switch to the right track. When you understand and then document the path dependency for your project, you have a powerful and influential decision making tool. When the path dependency links for the project outcomes are understood, the Project Governance team can thoroughly think through each decision in terms of the longer-term impacts before making it. A company was constructing a new quarry. One of the outcomes defined by the Steering Committee was “lowest cost supply to the local market”. The project was just about to commence constructing the rail line to transport gravel from the quarry when the Steering Committee discovered that the route chosen for the rail line, while the cheapest to build was not the lowest cost to operate. Once built, the siting of the rail line would be practically impossible to alter. The Steering committee decided to spend a little more to reroute the line so that it would be the cheapest to operate over the 50-year life of the quarry. Incidentally, as the rail line construction was on the critical path, this change increased both the time and cost of the project. But the Steering Committee made the change confident that it would deliver the project’s “lowest cost to operate” desired outcomes. Simplistic decisions made without taking account of path dependency (e.g. ‘just cut the scope’) can lead to massive value destruction. Sometimes, a decision made can mean that, due to the path dependent implications, the project will never be able to deliver what is intended and so it would be better to stop the project altogether. Your project can work on activities in the right sequence and make the right decisions to maximise your options at any point, so you can deliver the project results you actually intend. Making the decisions based on Path Dependency increases project success by enabling the project to deliver the outputs actually intended.